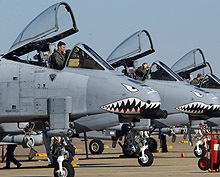 Pope Field, one of the busiest bases in the Air Mobility Command, is located in the Fayetteville, North Carolina area. They are home to Air Force units from five separate MAJCOMs and play a major role in supporting rapid deployment of the 18th Airborne Corps, 82nd Airborne Division, and Special Operations Forces. The base is nestled at the northern tip of Fort Bragg, approximately 12 miles northwest of Fayetteville. To the west are the Appalachian Mountains and to the east are the "Outer Banks" and the North Carolina National Seashore.